La Crosse Fish Decoys is the first and only book covering this subject matter. It should interest fish decoy collectors, hobbyists, fishermen, and anyone interested in a hobby that has a solid financial return. The heyday for spearfishing in La Crosse, Wisconsin, was 1890 until 1938, when spearfishing was banned in that region. Thus given the age of the decoys used, little is known concerning thei… r makers. Indeed, all of the known La Crosse fish decoy makers are deceased. This book is divided into seven chapters. 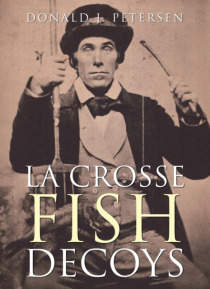 Chapter 1 provides a brief history of the La Crosse region from its earliest days until the present time with emphasis, when appropriate, to the sport of spearfishing. Chapter 2 discusses the development of the technique of spearfishing from its Asian origins and contrasts the American Indian approach to spearing to the white mens modification of it. In Chapter 3,The Mississippi River is discussed and its effects on spearing in the La Crosse Reach. The heart of the book is Chapter 4, when seventy-one known La Crosse decoy makers biographies are presented along the discussion of their decoys, not to mention, photographic examples of their work. Chapter 5 gives a photographic review of fish decoys which imitate actual fish species. Chapter 6 provides photographic example of La Crosse spears used by fishermen, and documents both known and unknown speak makers. Finally, Chapter 7 reviews La Crosse cheater decoys, jig sticks, lures, and decoy-holding boxes to round out the book.